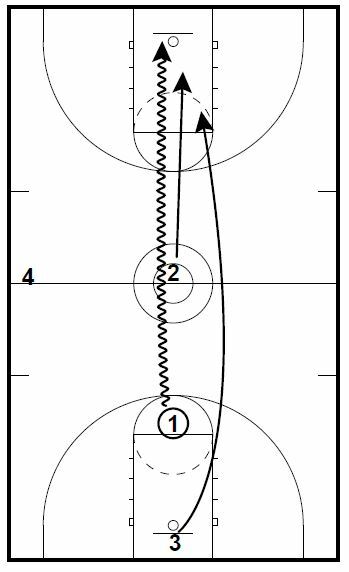 Today’s post is more drills from a collection put together by Nate Hill, Assistant Boys Coach at Colonel Crawford High School in North Robinson Ohio. 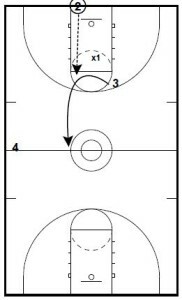 These drills are transition finishing and defending drills. 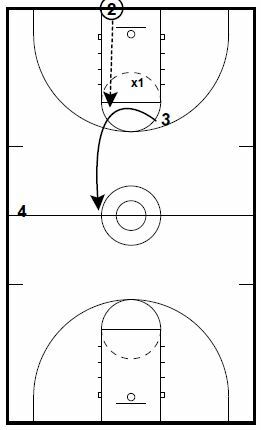 1 on 2 start at half court and the drill starts with 2 hand overhand skip pass. On the skip 1 and 2 attack the defender. The defender wants to get outside the lane to stop the drive. Shooter (1) goes to defense and must touch half court. 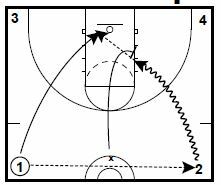 Defender and passer (2) get rebound and outlet to 3 or 4 quick. 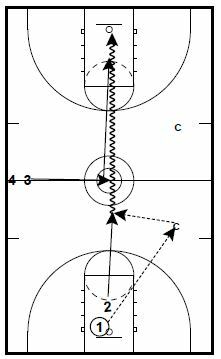 3 and 4 skip pass to next offensive players in line. x4 and x3 are now on offense. Get the outlets passes out quick so the defense works hard. Full court 1 on 1. 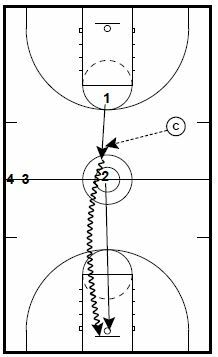 Offense starts with sprint and receives pass from coach. 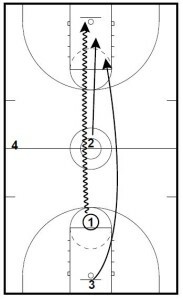 The defense cannot leave until offense touches top of jump circle. Defense tries to force offense outside the elbows, offense tries to stay inside the elbows. 1 made layup or 2 got rebound and outlets to coach. 1 and 3 are teammates, and 2 and 4 are teammates. 1st to 3 makes wins. Call fouls loosely. Be able to take contact. 1 gets pass and must run through the middle of the circle. 2 cannot leave until he touches 1. 3 cannot leave until 1 gets to circle. 1 finishes with contact. 1 is on defense, and 2 and 3 are on offense. 2 must take it out on a make. 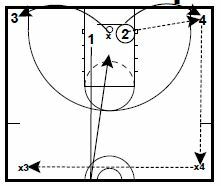 Keep score and switch offense and defenses.